KNYSNA NEWS – The intricate life of the Knysna dwarf chameleon constitutes one of nature’s fascinating displays and equally impressive is the time and effort put into their preservation and wellbeing by a dedicated, self-appointed Knysna “chamelianist”. For the past 15 years, local resident Aldo Kleyn has spent thousands of hours protecting, nurturing, caring and rehabilitating what has become an endangered species in Knysna. Kleyn, who moved to Knysna from New York in the months that followed the 9/11 attack on the Twin Towers, recalls a particular day when he was sitting at a restaurant in Memorial Square back in 2003, some days after his arrival in town. Kleyn says he felt sorry for the chameleon that just died, and wanted to gain more information on specifically the Knysna dwarf chameleon. But details on their lives were limited, so Kleyn went out searching for his own chameleons. 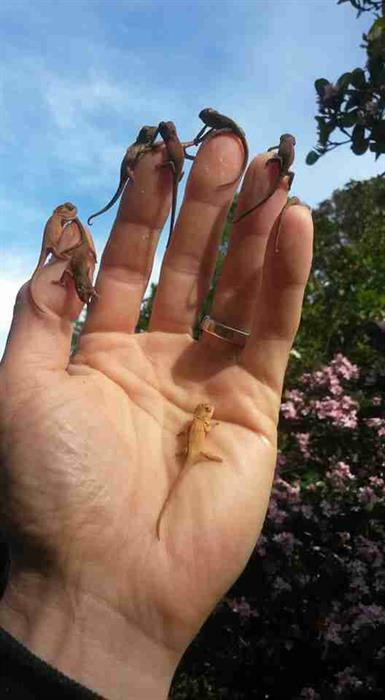 He found a month-old baby female chameleon, and a few weeks later found a little male. “So now I had this cute little couple who lived in my garden between a lemon and ficus tree. I gained some information on how to look after them and about a year later the female gave birth to eight babies,” says Kleyn. But what he saw next would change his entire perspective on looking after chameleons. As the babies grew and bred with each other, so did the size of the enclosure where they were kept. By this time Kleyn had gained invaluable knowledge regarding the safety of the Knysna dwarf chameleon, their habits and habitat, needs and diet requirements. The chameleons are fed with grasshoppers that are supplied to Kleyn from a farm in Karatara, meal worms, crickets and flies that are attracted to the sanctuary by a stink bowl – a concoction of fish and fruit hung near the chameleons. Kleyn says it started as an interesting hobby to learn about the Knysna dwarf chameleon but has now evolved into a passion to protect them, become their guardians and ensure their survival. “I’m an animal lover. I love all of God’s creations. During the first three years of starting this sanctuary, I’ve released more than 200 babies into the wild. 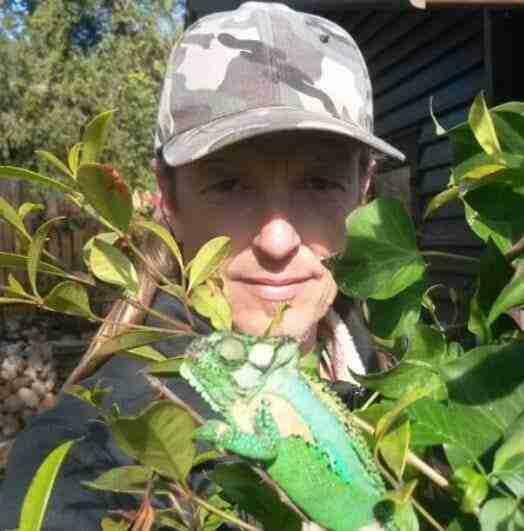 Of all the chameleons I’ve bred, about 95% is released in the Knysna forest,” Kleyn says. He also clarifies the colour-changing abilities of chameleons and states that they don’t change colour to camouflage themselves but rather to communicate. Kleyn, who is a fire victim of the June 2017 inferno, lost his home in Paradise along with 80 chameleons who didn’t survive. In the weeks that followed, hundreds of people around Knysna found injured chameleons, some blinded due to burns, others without a tail or front legs. Kleyn says he started the Facebook page Knysna Dwarf Chameleons to raise awareness on the plight of the creature, and to share advice and information on how to care for them. “The response from the community has been absolutely incredible. People love these chameleons and continue to shower praise and appreciation on the sanctuary for highlighting the importance of their survival,” says Kleyn, who adds that the public interest has led to the decision of opening a rehabilitation sanctuary where the public would be welcome to visit, as well as school education tour groups. “We have purchased a property at Eastford, where currently all the alien plants are being removed. We plan to turn this into a chameleon sanctuary where the public will be welcome. It will be run by trained experts and volunteers, all of whom share the same passion as myself when it comes to the Knysna dwarf chameleon. This is work in progress but hopefully it will be up and open really soon,” says Kleyn. He concludes by saying that members of the community are welcome to bring any Knysna dwarf chameleon to his sanctuary, or he can pick them up anywhere in Knysna. He is also available should people need advice on caring for these creatures. Klein says many people do not know that common pesticides used in gardens poison the food that chameleons eat, which in turn kills the chameleons. Trees – the champions of the plant world.